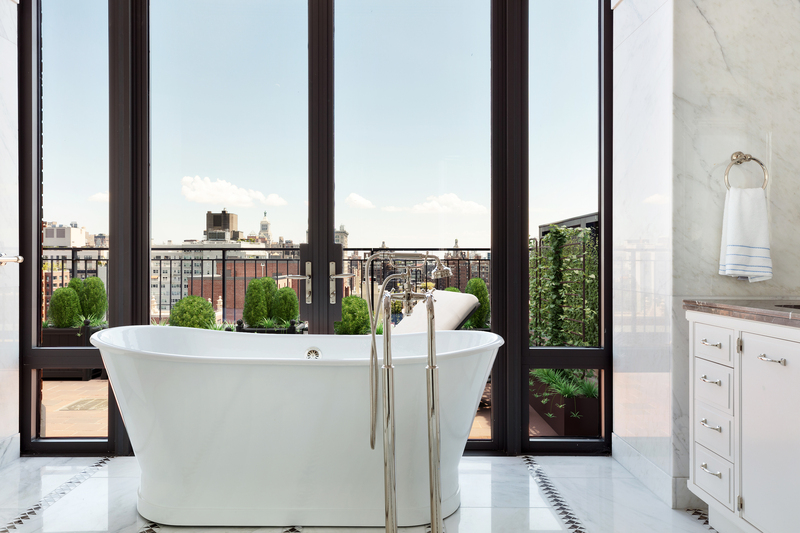 Soaring high above Greenwich Village with cinematic city views of all Manhattan sits the prettiest penthouse and jewel in the crown at the Greenwich Lane condominium. 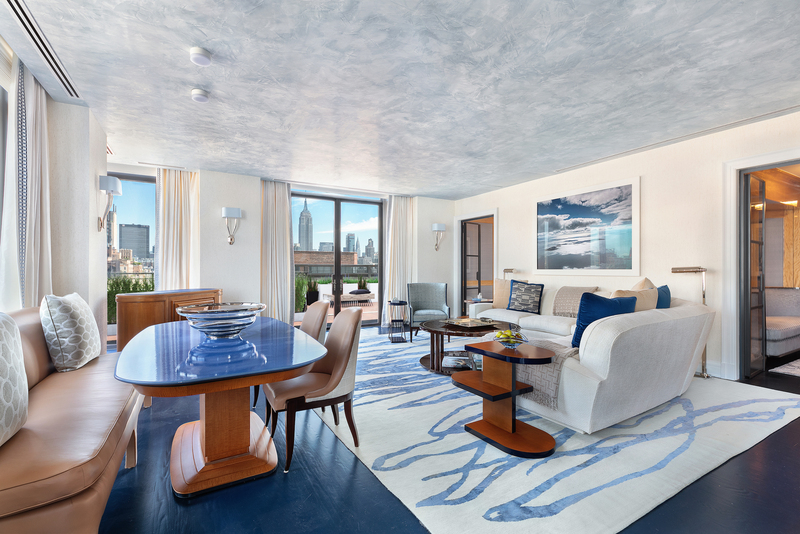 This penthouse is a 2,295 square foot two -bedroom home with every room opening onto the gorgeous terraces overlooking the Hudson River, Empire State Building and all points south to the WFC. 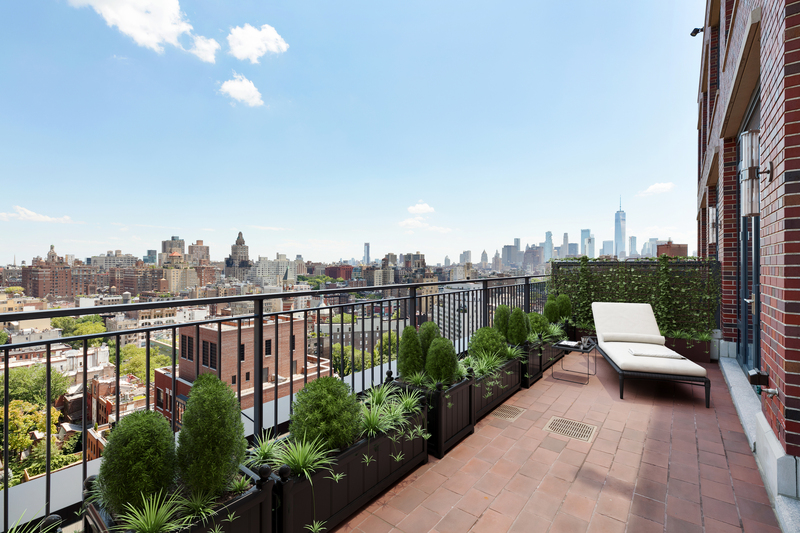 The turnkey apartment was designed by globally renown interior designer, Anthony Baratta with no detail overlooked. The great room, with multiple doors, leads out to the wrap terrace. 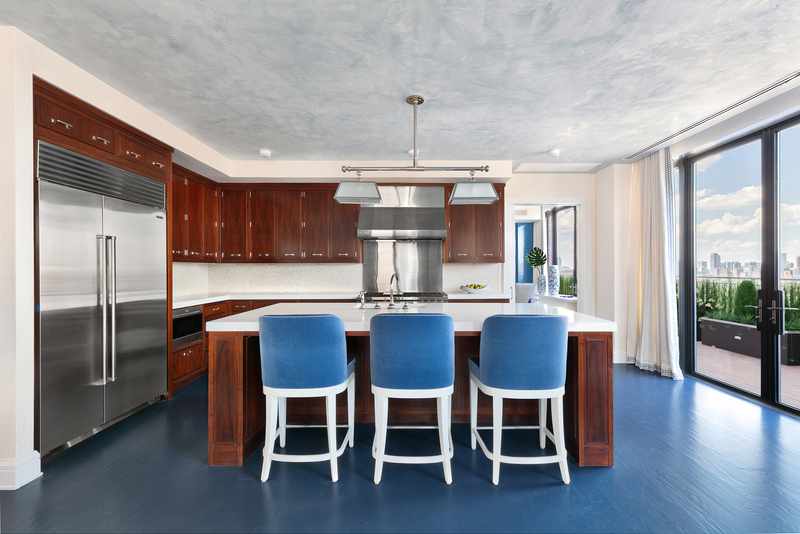 The open kitchen features top appliances and a soft palette of custom marble herring-boned backsplash. A large sliding door from great room opens to a media/second bedroom suite which opens to the west terrace overlooking the Hudson. The expansive master bedroom wing with gorgeous light blue and white woven linen wallpaper has a massive 10’6″ x 10’6″ walk-in closet, a private terrace perfect for morning coffee and a marble en-suite bath with free-standing soaking tub, radiant heated floors, double vanity, and separate shower. Light pours through the floor-to-ceiling windows which are outfitted with electronic shades and beautiful custom drapery throughout the home. The Greenwich Lane has an amenity package that includes a swimming pool, hot tub, gym, yoga and treatment rooms, golf simulator, children’s playroom, residents lounge, dining room with guest chef kitchen, 21-seat theater, cold storage, and the most elegant lobby downtown. This home is listed f0r $12.95 million with Stribling & Associates, an affiliate of Luxury Portfolio International®.